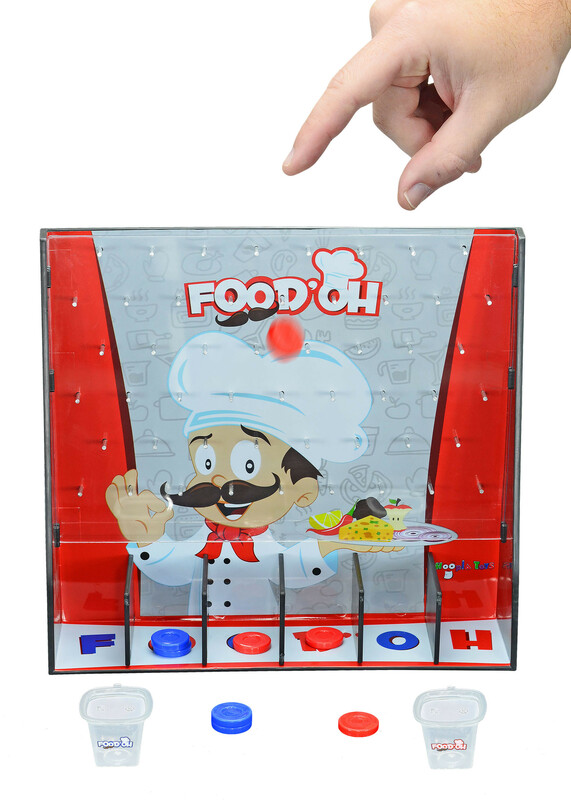 FOOD'OH is a game of luck, strategy, and will. Teams compete to see who can come up with the craziest concoction possible, and then see if the other team has what it takes to consume the resulting creation. The team with the most creative chef or the strongest stomach will win! FOOD'OH is a game of luck, strategy, and will. Teams compete to see who can come up with the craziest concoction possible, and then see if the other team has what it takes to consume the resulting creation. The team with the most creative chef or the strongest stomach will win! FOOD'OH is a family friendly eating game and is suggested for players 8 and up. Includes 1x game board, 4x Blue Game Chips, 4x Red Game Chips, 1x Blue Team Mixing Cup, and 1x Red Team Mixing Cup. Game Board dimensions are 11.00" x 2.68" x 10.00". Game chips are 0.91"in diameter and 0.17" thick. Mixing Cups hold 1 oz. The game board has metal pins so they won't break off like cheaper chip dropping games!